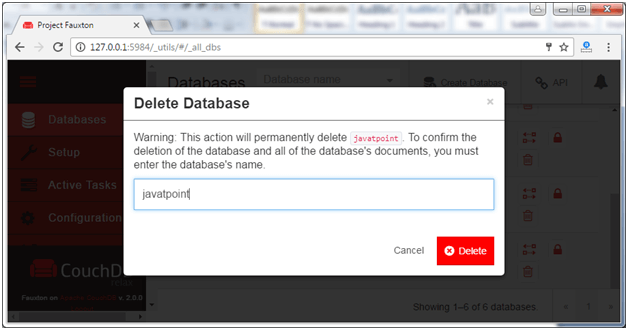 Here, we are going to delete "javatpoint" database. Click on the delete icon encircled in red. It will show a pop-up message asking to confirm the database name. Write down the name of the database. CouchDB facilitates you to delete a database by sending an HTTP request to the server using DELETE method through cURL utility. Note: -X is used to specify a custom request method of HTTP while communicating with the HTTP server. 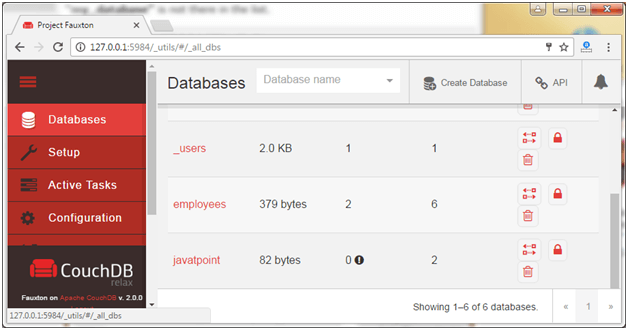 To delete a database, send the url to the server by specifying the database. Let's delete the database named "my_database". Here we can see that my_database is no more in list and it is deleted permanently.